August 7 is National Raspberries N' Cream Day in the United States. This food holiday is devoted to the delightful combination of ripe, juicy, tender raspberries and heavy, delicious cream. 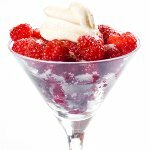 Raspberries and cream is a quick and easy dessert which is a perfect treat for a hot summer day. To make this light summer dessert, you will need fresh raspberries, whipping cream, chocolate, sugar and some other ingredients. Sprinkle 6 ounces fresh raspberries with 1 tsp sugar and 2 tsp orange liqueur such as Cointreau, Curaçao, or Triple sec (optional). Toss gently, set aside and let stand for about 1 hour. Chop 1 ounce dark or semi-sweet chocolate. Whip 4 ounces whipping cream with 2 tsp sugar and 1/2 tsp vanilla extract. Layer the raspberries, whipped cream, and chopped chocolate in serving glasses or bowls. To garnish, sprinkle with grated chocolate or crushed pistachios. To make the dessert healthier, you can substitute whipped cream with plain Greek yogurt. If you feel like baking, you can celebrate National Raspberries N' Cream Day by baking any dessert that requires the cream and raspberries combo. Cake, tart, cheesecake, cupcakes, soufflé, crème brûlée, custard, ice pops – any of these desserts will do.